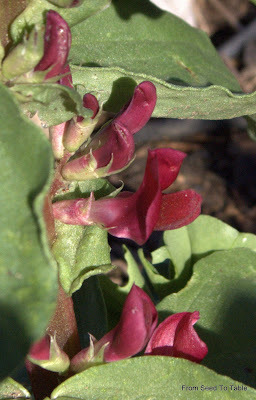 The Crimson Flowering Fava is another heirloom vegetable that I learned about in William Woys Weaver's book 100 Vegetables and Where They Came From. That book is really dangerous for someone like me who likes to grow unusual or rare vegetables. 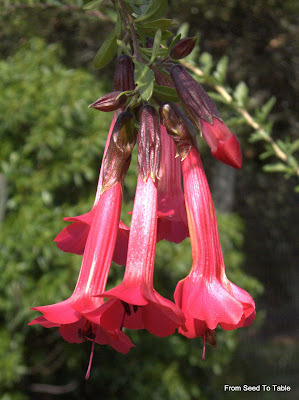 One of these days I'll have to make a list of all the plants that I sought out because I read about them there. 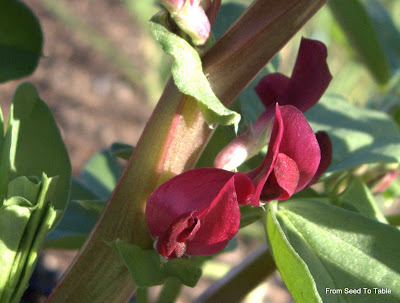 Anyway, the Crimson Flowering Favas were first documented in the 18th century in England. 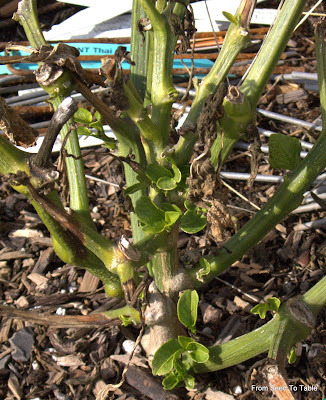 This variety was brought back from the edge of extinction when the last few seeds in existence were donated by the Cutbush family to the Henry Doubleday Research Association. 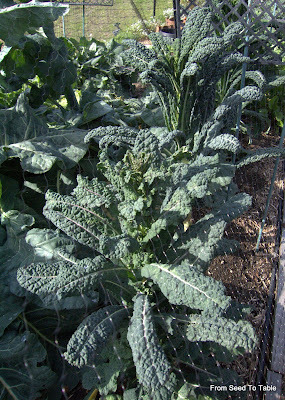 The association grew the seeds out and now some of the descendants of that stock are growing in my garden. Closer view of the blossoms opening. I got my original seeds from Copia through the Seed Savers Exchange back in 2005. Shortly after I acquired my seeds my husband and I decided to move so I didn't plant any of the seeds that year. I didn't plant any seeds the next year either because we were still searching for the perfect new home. The next year, nothing planted because we were moving at planting time. . . . . Finally, I planted them last year, but I put them in too late and the weather got too warm. . . . . I managed to save enough seeds to plant this year. And now they are starting to bloom! Yippee! 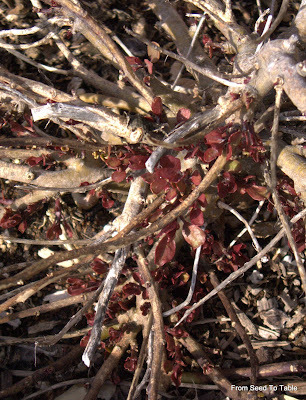 The stems have a red tint also. 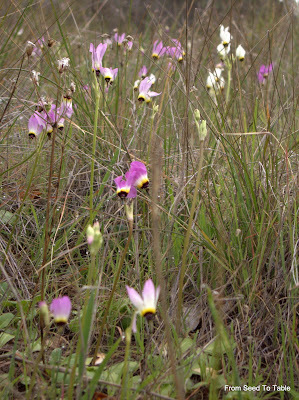 The plants are multi-stemmed and grow to about 2 to 3 feet tall. 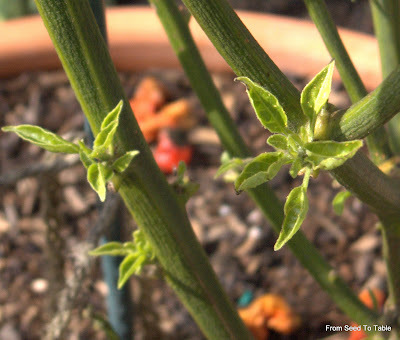 The pods are small and borne upright and have 2 to 3 medium sized green seeds. I have no idea what they taste like or how best to cook them since I've not yet grown enough to get to eat some. 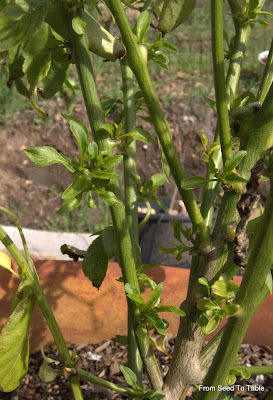 The tender new leaves are supposed to edible (I haven't tried them) as well as the blossoms. 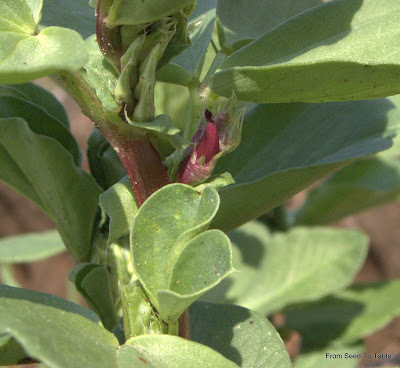 I've read that you can increase the yields of fava beans by snipping off the tops of the plants which will promote additional new shoots and will also direct more plant resources to the beans. 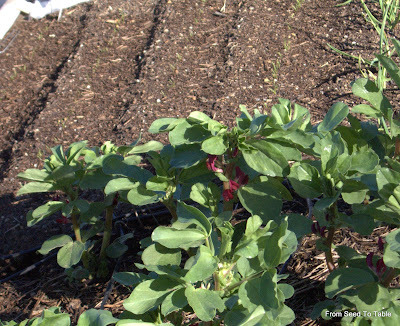 Favas are self-pollinating but seemingly irresistible to bees, especially bumble bees, so it is necessary to use some isolation techniques for seed saving purposes. The recommended isolation distance is one mile. 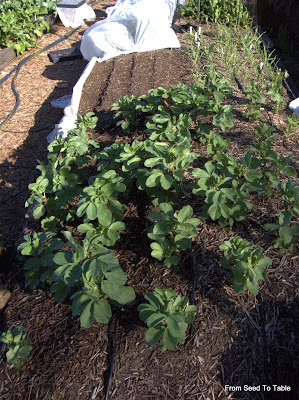 I'm growing 2 varieties this year so I am alternately covering the 2 different varieties with row cover to keep them from crossing. I could probably keep one variety under cover and one exposed, but I like to uncover them to allow them full exposure to the sun. This is still a very rare variety and difficult to find, although there are 4 members of the Seed Savers Exchange offering seeds in the 2009 yearbook. I also found one Canadian seed company that is offering 10 seeds for $4.95 (Canadian), yikes 50 cents a seed! Perhaps a more thorough internet search would lead to more sources, but I think I'll save my own. The chile pepper and eggplant seeds that I sowed on February 17 started to germinate on the 22nd and are continuing. 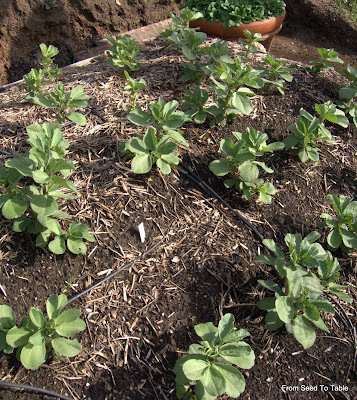 Most of the varieties have started to sprout with the exception, mostly, of older seeds. It also seems like the seeds closer to the center of the unit are germinating faster, so today I turned the flat around so the pots that were at the end are now closer to the center. 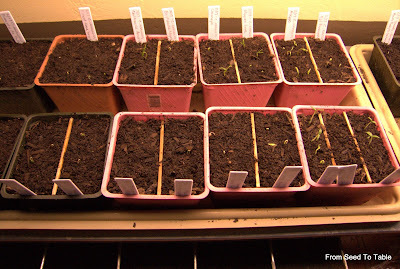 Tomato seeds were sown into the other flat on the 20th and the first sprouts were appearing yesterday. 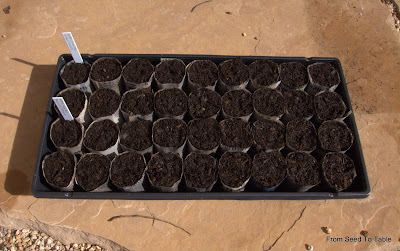 The next seed starting project is for seeds that don't like to have their roots disturbed. Those seeds get sown in paper pots. I have a nifty little paper pot maker which you can see in the background above. I tear newspaper into strips about 3 1/2 inches wide by 12 inches long. 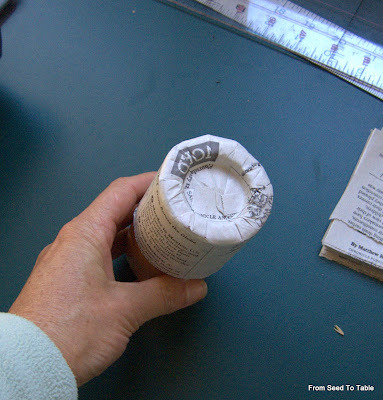 A strip of paper is wrapped around the pot maker with about 1 1/2 inches extending off the end of the form. Pleat the overhanging paper over the end of the mold. 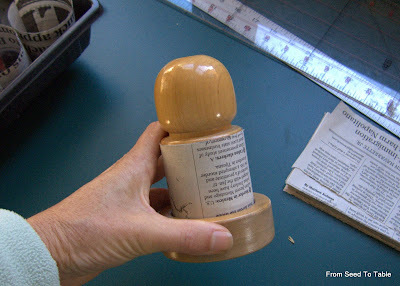 Twist the mold into the base to crease the bottom of the paper into shape. 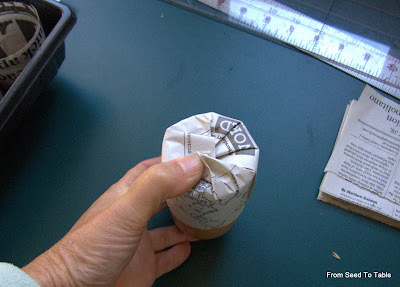 The result is a nice little paper pot that you can slip off the mold. Voila! A nice little pot ready to be filled with soil. The flat above contains newly sown seeds of Magnolia Blossom Snap Peas and Green Beauty Snow peas. 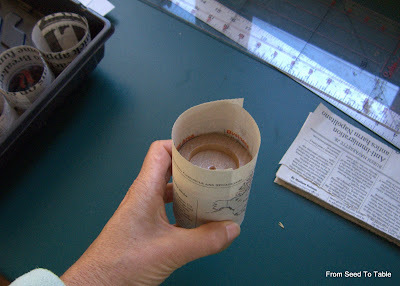 When I put the plants in the garden, I tear off the top 1/2 inch or so of paper to make sure that it doesn't extend above the soil. 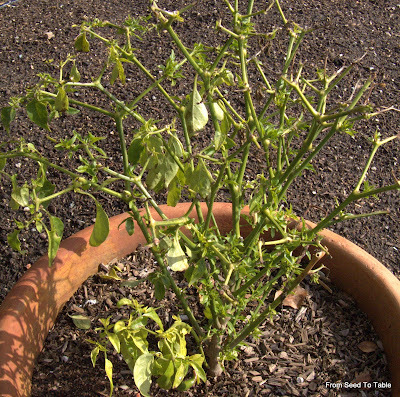 Doing so prevents the exposed paper from wicking moisture away from the rest of the pot buried in the soil. 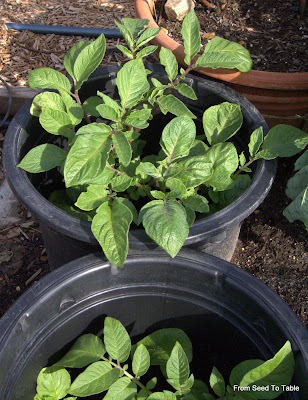 In my opinion, the paper pots are far better than peat pots for a few of reasons. First, it's a way of recycling newspaper rather than using a resource that is only very slowly regenerated. But more importantly, paper pots allow for better root development. 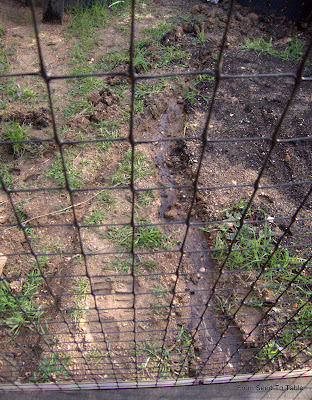 Peat pots decompose very slowly and roots don't get through them very easily. 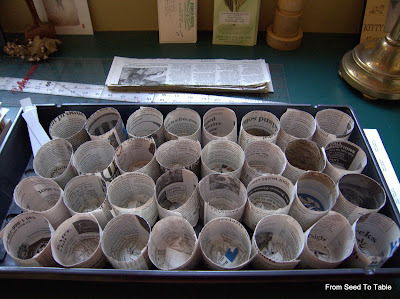 The paper pots, on the other hand, break down very rapidly once they are in the soil which allows roots to spread out easily. I even have seedlings that send their roots right through the sides of the pots into the neighboring pots while still in the seed tray. 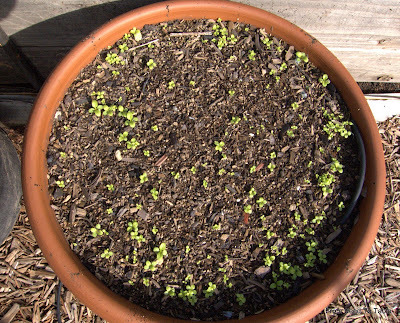 Another problem with peat pots is that if they are allowed to dry out too much they actually start to repel water and become difficult to rewet - not good for those tender little roots that are in contact with the peat. 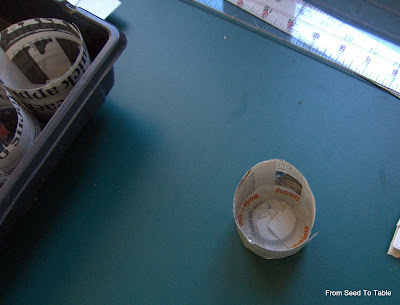 The only complaint I have about paper pots is that making them is a bit tedious. So, I keep a stack of paper strips and the pot maker by the computer and when I'm sitting there waiting. . . . I grab a strip and make another pot. As soon as I 've made another tray of pots I will be sowing seeds of Golden Sweet Snow Peas, Red Florence Fennel, and Diamante Celeriac. 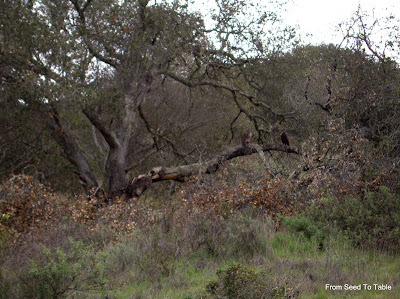 Do you see them perched on the fallen limb of the Oak? 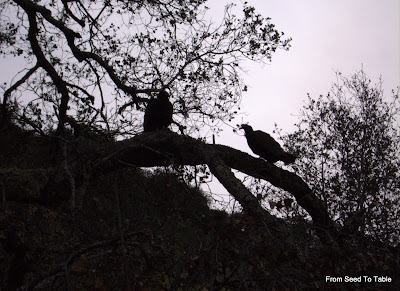 I crept up the hillside with my camera. I got a close as I could until they started getting nervous about me. 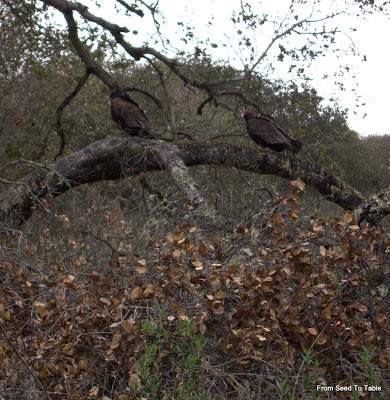 It's a couple of Turkey Vultures. I went back down to the garden after this shot. After they left I went up to see if there was anything there. The deer like to spend the night under this tree. I was happy to find nothing other than limbs that had fallen last winter. There's a good view of the vegetable garden from up there. And a nice view across the valley. Fungi are at work on the dead parts of the oak. 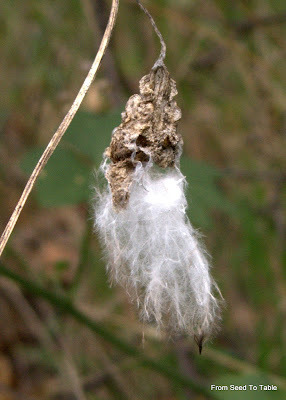 I thought this was an interesting seed thingy. stuck to an old leaf. 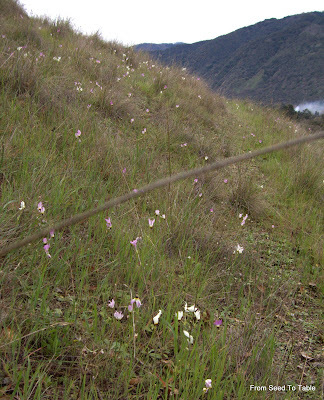 There's a nice patch of Shooting Stars further over. 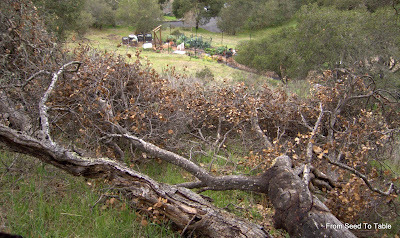 to burn brush and tree trimmings. 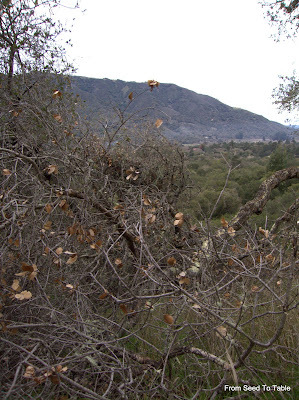 There were little plumes of smoke up and down the valley. 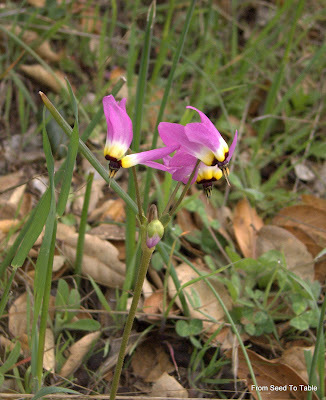 The Shooting Stars come in various colors. I saw the first Blue Dicks blossom! Golden Corn Salad volunteering in the gravel patio. I included a few photographs of Golden Corn Salad in my previous post. Karen asked if corn salad is the same as mâche, which it is, but Golden Corn Salad is actually a bit different. So I thought a post about the Golden variety would be nice to do. 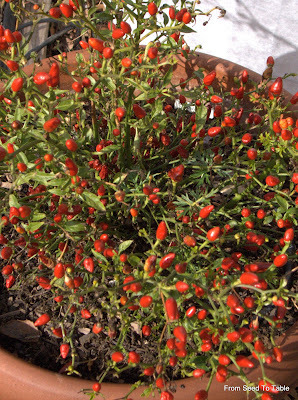 "Vit" Mâche (V. locusta) growing in a pot. First, let me say a bit about mâche. 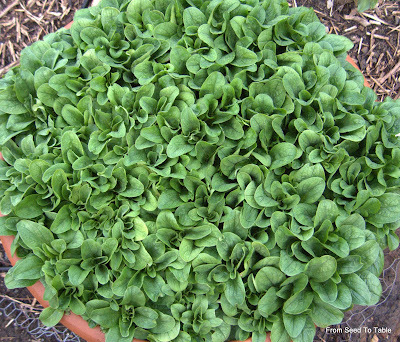 It has many aliases, including lamb's lettuce and corn salad, but the botanical name of the commonly cultivated varieties is Valerianella locusta. 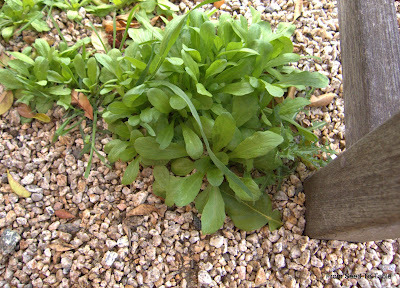 Mâche, under the guise of corn salad, has been in American kitchens since the 17th century (and much earlier in Europe), but it was generally collected from the wild and not really cultivated until the 18th century. The name corn salad comes from the fact that this green was commonly found growing wild in wheat fields and in England wheat was commonly referred to as corn. I don't know the derivation of the name lamb's lettuce. More volunteers in the gravel under a bench. 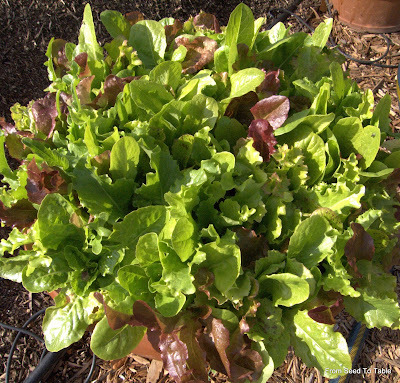 Golden Corn Salad is a bit different from the common and easily found varieties. 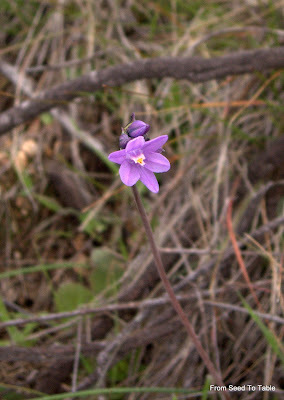 Botanically it is Valerianella eriocarpa. It is also know as Italian Corn Salad since it is native to the Mediterranean and grows wild throughout much of that area, including North Africa. 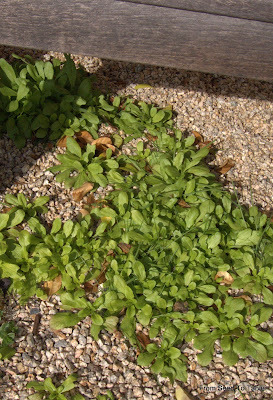 Valerianella eriocarpa wasn't brought under cultivation until the 19th century. 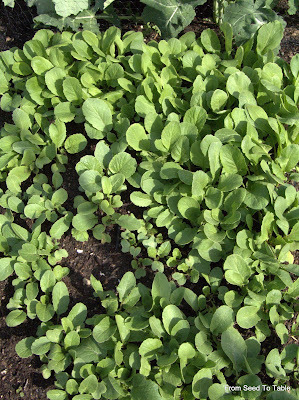 Growing requirements are also a bit different for Golden Corn Salad. 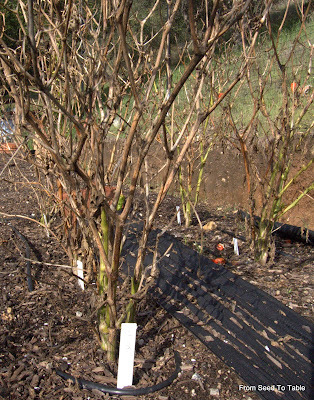 Its Mediterranean origins are evident in its cold hardiness. 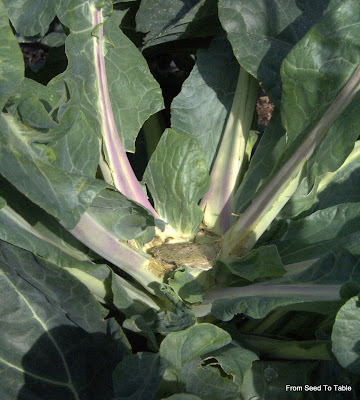 I don't know just what USDA zone it is hardy to, but it's supposedly not as cold tolerant as V. locusta. 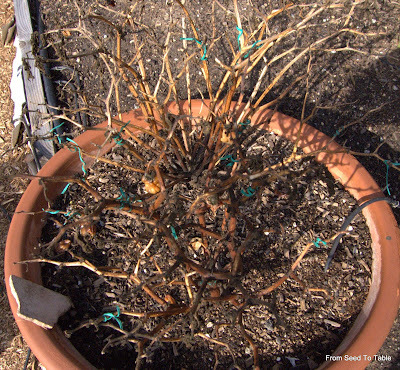 It does, however, survive my zone 9 winters handily (hmm, well I do live in a Mediterranean type climate zone). 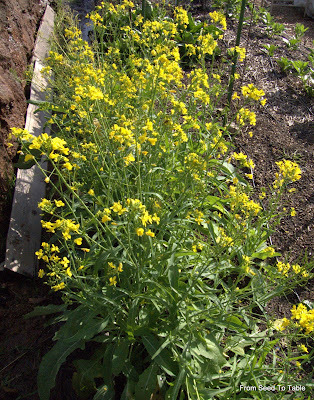 On the other hand, Golden Corn Salad is more heat tolerant than other corn salads so it does not bolt as quickly and can be harvested well into June and possibly July if grown in a shady spot. It doesn't seem to particularly fussy about soil, as is evident by how nicely it grows in my gravel patio! 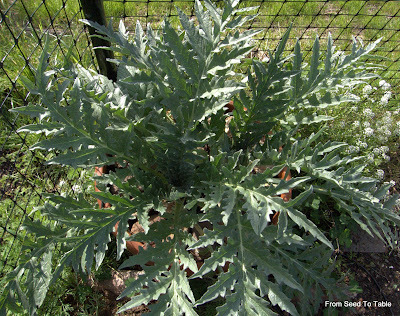 It can grow to be quite large, up to 16 inches (supposedly), when grown in rich soil and has been used as a spinach substitute. 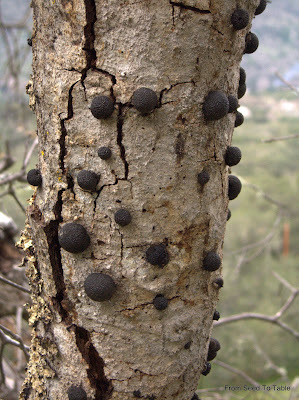 It more commonly grows no larger than about 6 or 7 inches in diameter. I tend to sow it rather thickly so it stays even smaller. You can see how large it is growing in the pot below. It volunteered in that pot and is sharing space with a Satsuma mandarin which is on the decline. 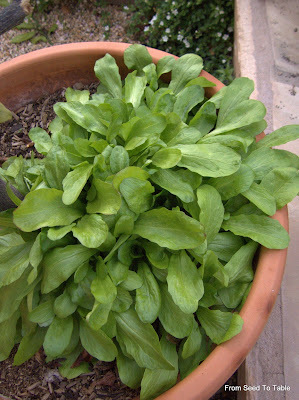 The corn salad is obviously enjoying the fertilizer that I provided for the mandarin. The flavor of Golden Corn Salad is considered to be more mild and more nutty than it cousins. I'm not sure I can detect a huge difference, I find both types to be delicious. 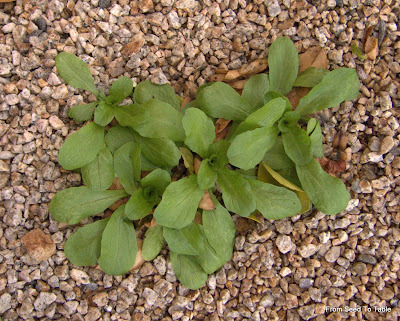 Both types of cornsalad are wonderful dressed with any kind of nut oil which enhances the nutty quality of the greens.You can see in the photographs that it is not truly golden, but more of light green. So, you ask, where can you get some seeds? Well, if you are planning a trip to Europe... Or perhaps you have a friend in Europe... Unfortunately, there does not seem to be a commercial source for seeds in the States. Ok, I hear you... where did I get my seeds? The Seed Savers Exchange Yearbook, back in, oh.. I don't remember. I requested and received seeds from William Woys Weaver who is the source for all the information that I'm sharing here. Find a copy of his book 100 Vegetables and Where They Came From if you would like to learn even more. Unfortunately, he doesn't list in the exchange anymore. But... I have been saving the seeds and have a tiny bit to share with my fellow north American gardeners. Notice how most of the photos are of volunteers? 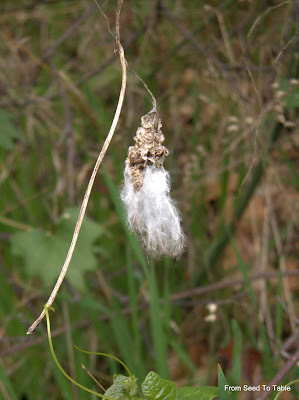 Well, I was a little late in collecting my seeds last year and many of them scattered around the garden... So, first come, first served. This blog is supposed to be my garden journal of sorts, so here's a lengthy visual inventory of whats happening in the vegetable garden today. Well, actually Wednesday when I started putting this post together. the bench outside my dining room doors. in the garden where it belongs! 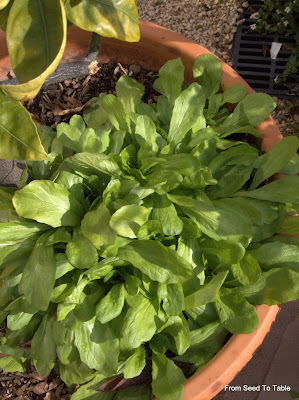 Cutting lettuces in need of a salad bowl. 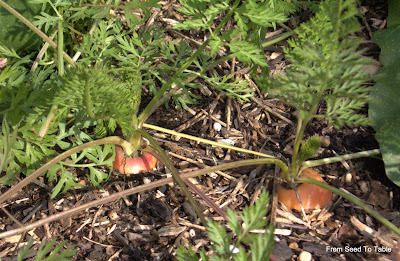 Scarlet Nantes carrots sown last fall. 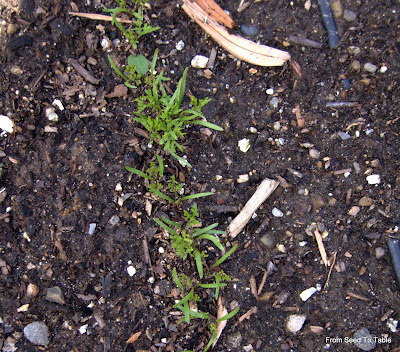 Scarlet Nantes carrots sown on January 13. 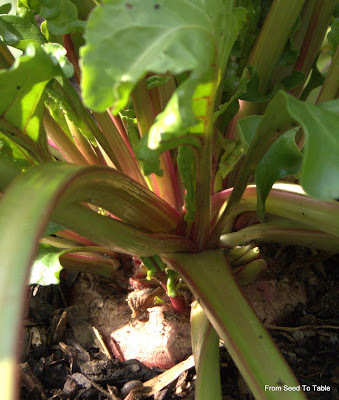 One of the last Chioggia beets sown in the fall. 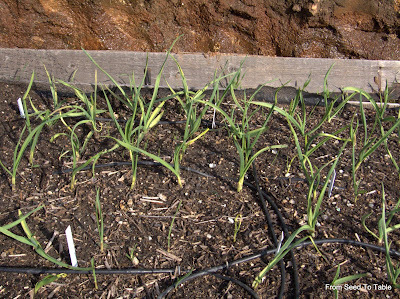 Extra garlic planted to harvest green. See all the moisture in the back? 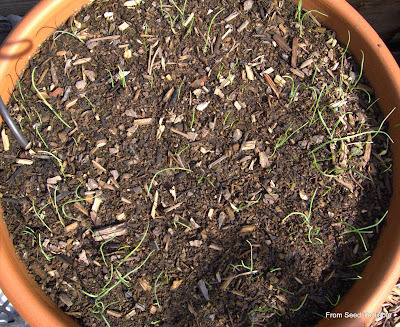 Garlic bulbils sprouting, an experiment. much happier in its new bigger pot! 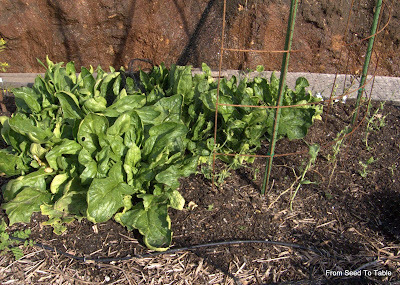 Giant Nobel Spinach in need of harvesting. 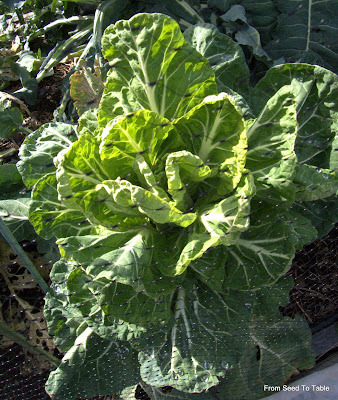 Portuguese Cabbage starting to bolt. Stump of harvested Romanesco Broccoli. I like the purple color in the leaf stalks. but the bird netting is in the way. 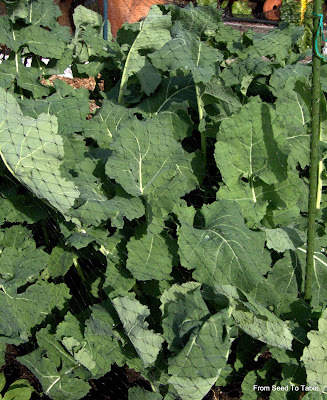 Olive Leaf Rapini in full bloom. 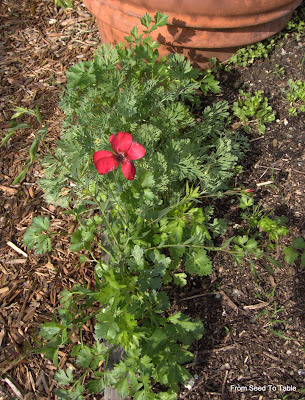 Italian Parsley and California Poppy volunteering. 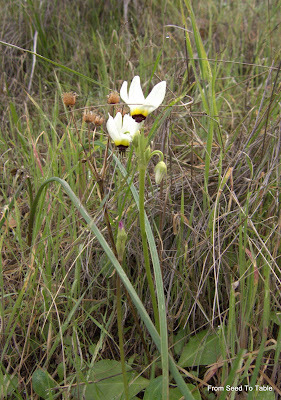 A wildflower (flax?) leaning in to hog the picture. Thai Chile, going on year 3. A closer look at the Aleppo Pepper. Do you see the flower bud? They have come back from looking like this. 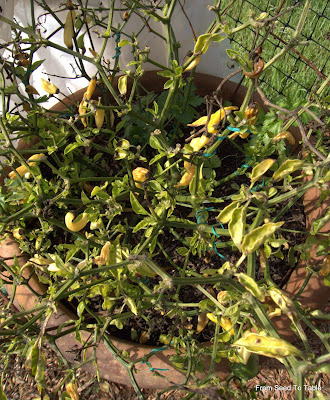 Aji Dulce, not much life here. 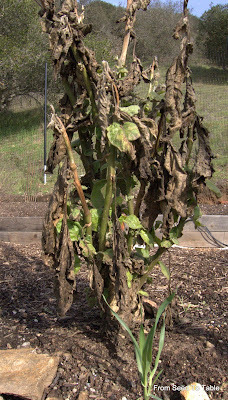 Rosita Eggplant, hanging in there along with her friends. Late for the Dinner Party!